The Chinese cultural influence can be seen in the world of fashion globally. From dragons to bamboo shoots, each cultural art of China has taken the fashion world by storm. Another facet of the Chinese culture that has grabbed the attention of the fashion world is the Chinese Zodiac. Chinese Zodiac involves 12 signs Rat, Ox, Tiger, Rabbit, Dragon, Snake, Horse, Goat, Monkey, Rooster, Dog, and Pig. You can learn how the Chinese zodiac came into being by reading the introduction to the Chinese Zodiac. The zodiac works in a recurring 12-year cycle with each year dedicated to an animal. The traits of the animal ruling the particular year will affect the personality of the person in that particular year. The Chinese zodiac is seen to have a strong influence in the fashion world with some major fashion houses using them as an inspiration for their designs be it accessories, makeup, sneakers or clothes. One such popular men’s brand which has brought out amazing jeans inspired by the Chinese Zodiac is RMC Jeans. RMC Jeans is popular equally with celebrities as well as common people. However, with RMC Jeans you not only get to appreciate the Chinese culture but also the Japanese Culture. The designs are exotic, unique and truly brilliant. Last time we spoke about the year of the rat and year of the ox designs. 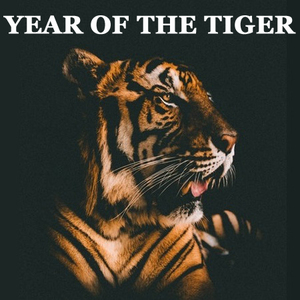 Today we will talk about the year of the tiger design. The years of the tiger are 1914, 1926, 1938, 1950, 1962, 1974, 1986, 1998, 2010, 2022, 2034, etc. According to the Japanese culture, the guardian deity of the year of the tiger is Kokūzō Bosatsu. He is also the guardian deity of the year of the ox. The beautiful hand-embroidered design of this deity can be seen on one of the pockets of the RMC Jeans Year of the Tiger Raw Denim Jeans. He is sitting in Padmasana, a meditative pose on a lotus flower which symbolizes purity and detachment from all worldly desires. Kokūzō Bosatsu is the deity of wisdom and compassion. He imparts intelligence and wisdom to people. In his left hand, he holds the wish-granting jewel, lucky for those born in the year of the tiger and ox as all their wishes will be granted. In the right hand he is holding a sword which symbolizes wisdom cutting through ignorance. On the other pocket is the kanji word for this deity. First of all, this pair of jeans is genuine raw selvedge denim and upon that the awesome intricate hand-embroidered pockets makes this a must-have apparel. Moreover, the people born in the year of the tiger are supposed to have a strong sense of fashion. They are in fact trendsetters and not followers. They love to make a statement by standing out in the crowd, an obvious quality of leading whether it is fashion or any other field. Blue is their lucky colour too along with grey and orange. Apart from that, they are also known for their brave, competitive, unpredictable, and self-confident traits. So here is your chance all Tigers to go ahead and make yet another style statement.